Travis Goldstein will return to our club as guest presenter this month. 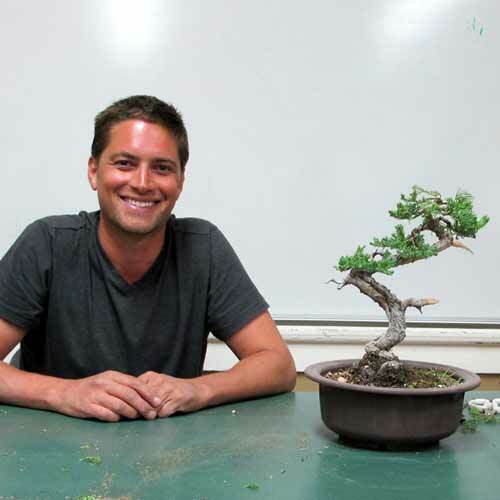 Travis is the owner of California Bonsai Studio, 4015 N. Moorpark Rd, Thousand Oaks, 805-616-2271. This month his topic will be “pines.”Not sure as of this writing what exactly he’ll be doing with his pines, but it’s sure to be interesting. Last November his goal was: “How to make a trunk seem bigger than it is,” which is better than my usual “presentation” on “how to turn a tree into a lifeless stick.” Travis started with an overgrown juniper that lacked focus. He then did some judicious pruning, wiring, and jin-ing to give the tree a more balanced and refined look with branches, foliage and trunk all in more pleasing proportion. After a lot of phone calls and field trips, we now have a firm date and place for our 2018 show: Fellowship Hall at Trinity Lutheran Church on the corner of La Cumbre and Foothill roads, on May 19-20, 2018. The price is right, we’ll have plenty of room, access is good, and it will be free to the public. That’s some of the good news. The other good news is that Tina Hammond has volunteered to host our December potluck and raffle at her house. Thank you Tina. The unwelcome news this month is that dues and workshop fees must go up in 2018. We last raised dues in 2013, but unless we somehow attract a dozen or so new members for the coming year, dues will be go from $30.00 to $35.00 per year so we can just meet expenses for the GVCC meeting room and two or three outside Tuesday evening presenters. Saturday workshop fees will go up to $120 per semester, and even at that price we’ll have to average 17 participants per semester to break even. All is not gloom and doom, however. The club does have a nice anonymous endowment as well as money generously donated by the family of faithful late member Sally Gilmore. Those accounts are not intended to pay for routine expenses, but rather special events and other out-of-the-ordinary things that would benefit the club, and we should be more actively planning to make use of the money. Your suggestions for some exciting possibilities are always welcome, so please fill up my in-box with your ideas. Hard to talk about holiday parties already, but the season is almost upon us! 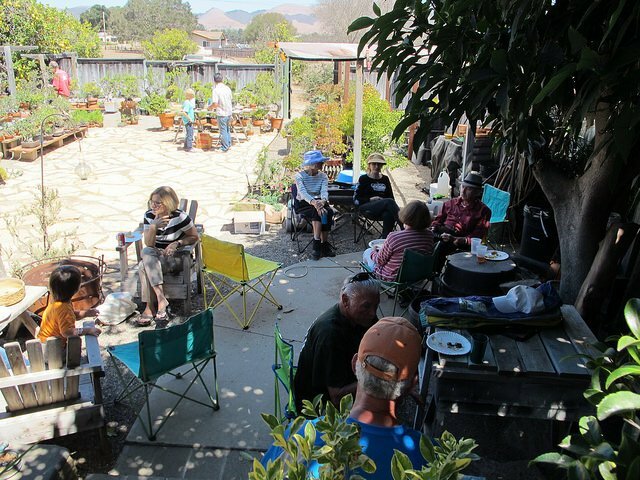 This time, Club Treasurer, Tina Hammond, has offered to host our holiday party and raffle at her Mesa home. It’s a little too soon to prepare your potluck dish unless you use lots of preservatives, but not too soon to think about what you might bring to share, including something to donate to the raffle. A tree, a tool, pot (bonsai pot, not cannabis unless you bring a huge potluck). 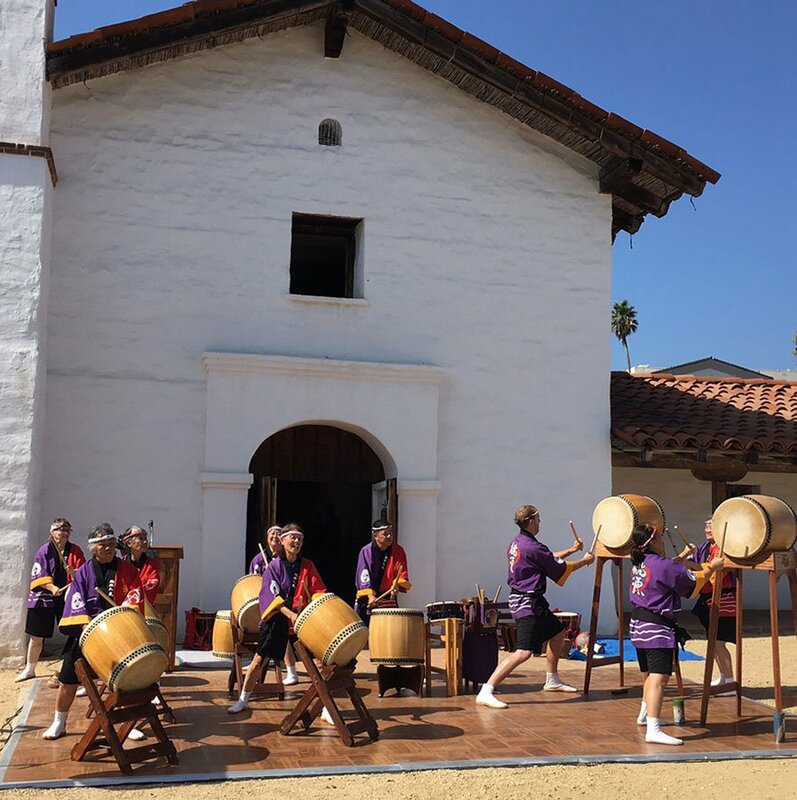 We had our best year ever at the Santa Barbara Trust for Historic Preservation Asian American Neighborhood Festival, an outdoor event celebrating Asian American heritage at El Presidio de Santa Barbara State Historic Park. This year they put us with the vendors and we got a prime spot thanks to Tom Post, who was there so early organizers thought he had slept there with the other transients (kidding). There was a lot of foot traffic and interest was high, especially when the director, who misunderstood, announced to all that we had trees for sale. Seeing as he wasn’t there, we almost sold Wally’s tree so we could all afford lunch, but Joe said Wally would most likely remember he gave us a tree to show. Seriously, though, it was a great day and we were just the right distance from the drumming and dancing so we could watch, but still talk to visitors. Thanks to Joe, Tom and Keith for manning the booth. I always learn a lot eavesdropping on the experts. 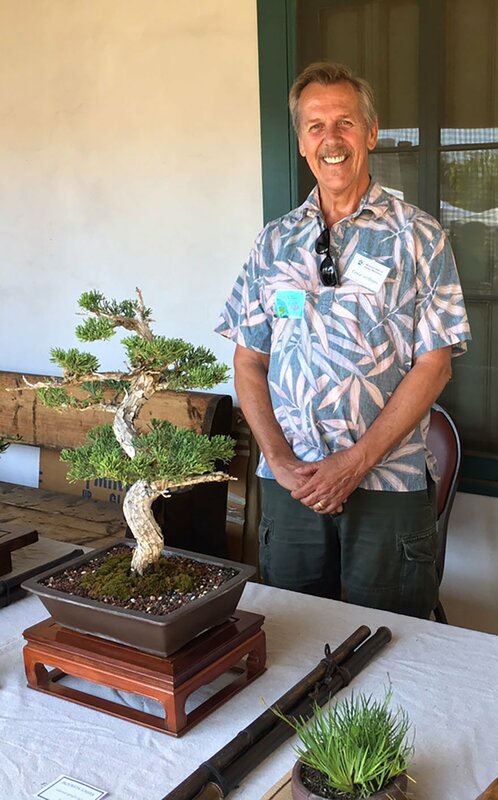 Fresno Bonsai Society: Tenth Annual Bonsai Yard Sale at the Clovis Botanical Garden, 945 North Clovis Ave. Fun starts at 8 AM and ends at 2 PM. 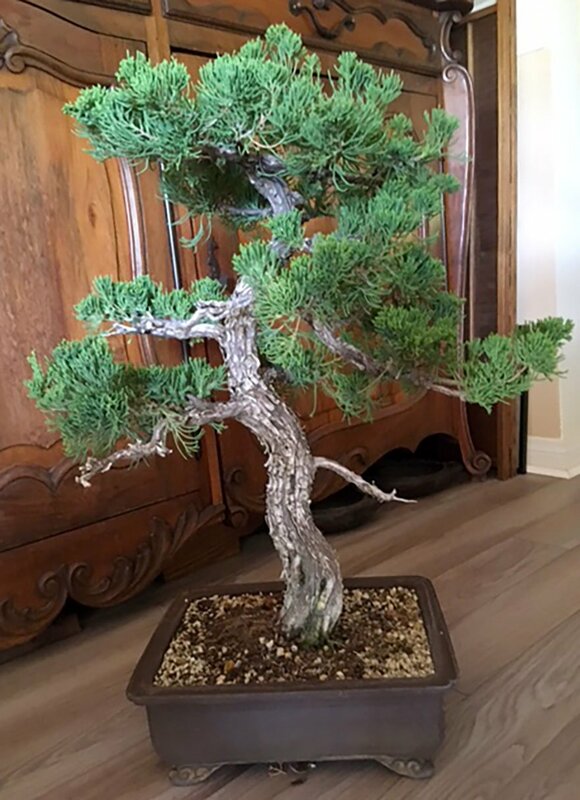 Everything bonsai for sale: pre-bonsai, finished trees, pots new and used, books, soil, stands, accent plants, suiseki and more. 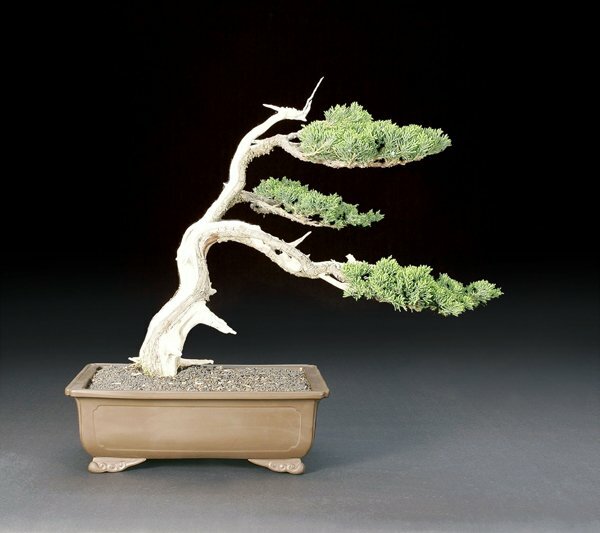 Everyone is welcome to buy, sell or trade bonsai related items. Small-town bargain prices. Coffee, donuts, free admission, lots of parking; join old friends for this annual ritual and come early for the best selection. For more information, contact David Soho at sohofive@yahoo.com. Member’s Trees – Bonsai Bros! Several years ago I bought a juniper at our annual show and sale that had originally belonged to longtime member Ann Beebe. I thought it was one of a kind, that’s why I paid $3500 for it. Or was it $35? Hm. Recently, though, I found my tree had a brother that belongs to Keith Mautino… “The original guy that sold those to us back then was Ben Suzuki. 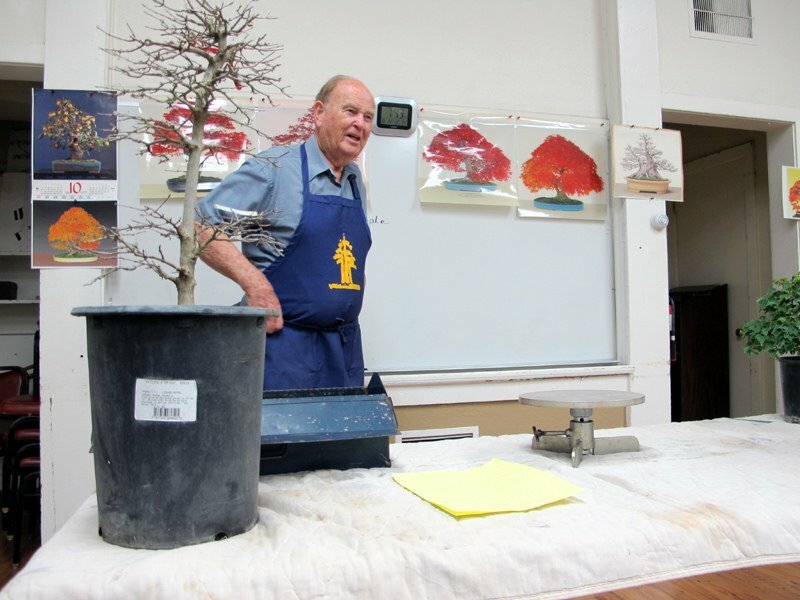 He sold bonsai starter plants out of the back of his big forest green van in the parking lot at the adult education center downtown. These junipers were saplings twisted around a small redwood stake and tied on with green plastic tape to create curves in the young trunks. The first half hour of class was consumed with him selling materials to all students in the class. I met Ann Beebe when I was 15 years old at this first adult education class taught by Ben. Sally Gilmore, Edna Hesthal and Amy Kakimoto were in this first class with me. I joined our club the same year. 40 years ago. 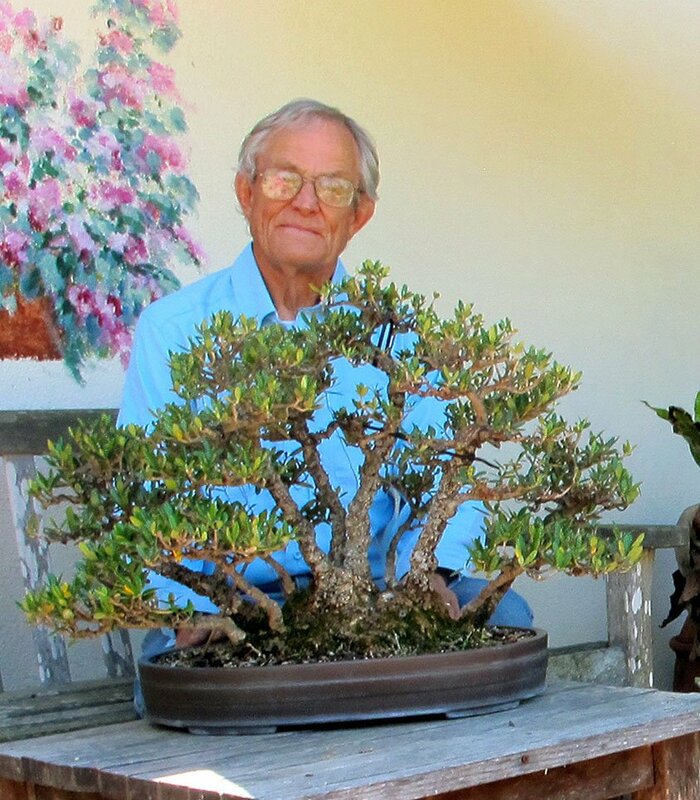 Ben lived in Los Angeles and was an old-school Japanese nurseryman and instructor for hire…” Trees have stories! 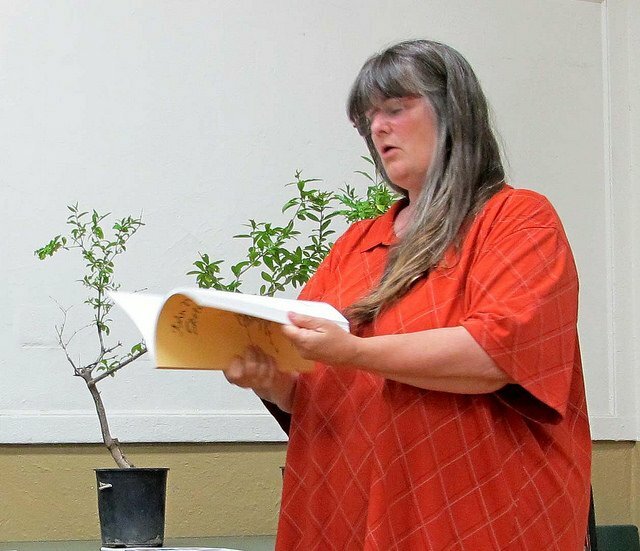 And bonsai club members have stories. Send your tree’s story in for the next newsletter. Maybe a long-lost relative will come forward for your tree, also!